Please read this guide carefully as you are working with your Private Keys - These are important, anyone who has access to your private keys can spend your Feathercoins. This guide aims to help users access their private keys from their android wallets, as well as move them to the desktop QT wallet. Step 1: Back up your Android Private Keys. You will be prompted to choose a password for your backup. What this does is use OpenSSL to encrypt your list of private keys, this is a security measure. Navigate around your External Storage till you find your backup file. Step 3: Use OpenSSL to decrypt your backup file. Note: The easiest thing to do is to download the “binaries” of OpenSSL. This means you don’t need to install anything or run any kind of setup. If you have done the above correctly, you should have 1 folder on your desktop called "OpenSSL"
What we are going to do here is add the OpenSSL binaries to your system environment path. What this means in laymans terms is you can open CMD and type “openssl” where ever you are and it will run the openssl program, instead of navigating to the openSSL folder etc. The top box is for your localuser, the bottom box is for the entire system. Add your OpenSSL bin folder path by clicking new and then type out the folder location on your desktop. click “OK” until you’ve left all the system properties boxes. Now that we have everything working. Lets get your private keys. You should have your Feathercoin Android Backup file on your desktop by now. make sure to change the file name to whatever your backup is called. 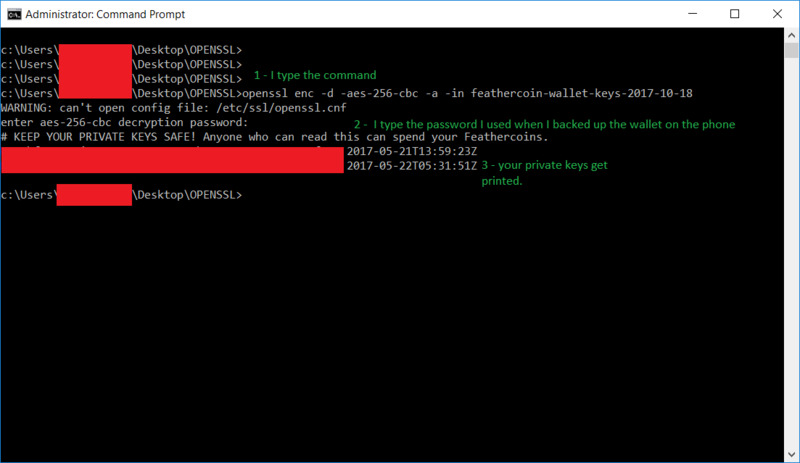 Your private keys will be printed inside the CMD window.